Each of our highly experiential, participatory workshops is tailored to your specific needs and objectives. They typically extend over 2-5 days and consist of up to 15 participants representing a vertically and horizontally diverse cross section of the organization. 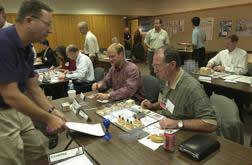 However, we can accommodate a wide range of workshop lengths, number and organizational make-up of participants. Please call or email to discuss your specific workshop needs.